This is from an actual email my brother sent me earlier this week! I've been slowly going through the HP lovecraft stories on my kindle. So many of the stories could have been resolved by the main character running the fudge-packer away. The most creepy story so far has been the one with dimension angles/super-hearing curse/child-sacrifice/debased rat eating through the main characters body to get to the heart. Actually, i think that Brown Jenkins were well done in Stuart Gordons "Dreams in the Witch House". *shudder* That is one freakish Brown Jenkin. He was the scariest thing to me about that story. Genus, I'm guessing you haven't seen the short film accompanying your posted image? Jeezuz . . . that is the creepiest rodent ever. It doesn't help that I have a ridiculous and completely unmanly phobia of rodents. Almost all of my (frequent) nightmares are about rats, and if I see a mouse run across the floor, I'm up on the furniture shrieking like a '50s TV housewife. So yeah, Brown Jenkin is the stuff of nightmares. Also, "Brown Jenkin" is a disturbingly whimsical name for such an abomination. This one does get bad press, but it's one of my favorites. Probably because it's one of the first of HPL I read back in the day, and the combination of the house, the weird other dimension geometry and Brown Jenkin just got to me. 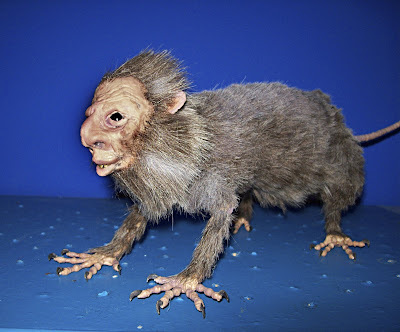 How could one not love a story with a little rat monster with the zany name of Brown Jenkin? By their own account on September 1931, the Irving family, consisting of James, Margaret and 13 year old daughter Voirrey, heard persistent scratching and rustling noises behind their farmhouse's wooden wall panels. Initially they thought it was a rat, but then the unseen creature began making different sounds. At times it spat like a ferret, growled like a dog or gurgled like a baby. The entity soon revealed an ability to speak and introduced itself as Gef, a mongoose. It claimed to have been born in New Delhi, India, in 1852. According to Voirrey, the only person to see him properly, Gef was the size of a small rat with yellowish fur and a large bushy tail. (The Indian mongoose is in reality much larger than a rat and does not have a bushy tail). Gef claimed at times to be "an extra extra clever mongoose", an "Earthbound spirit" and "a ghost in the form of a weasel". He once said: "I am a freak. I have hands and I have feet, and if you saw me you'd faint, you'd be petrified, mummified, turned into stone or a pillar of salt!" Oh my....It is smiling at me....right now. Yes, Sir, my teacher told me so! You know, the name Brown Jenkins is pretty close to the kind of names found for demonic familiars in the Salem Witch Trials. 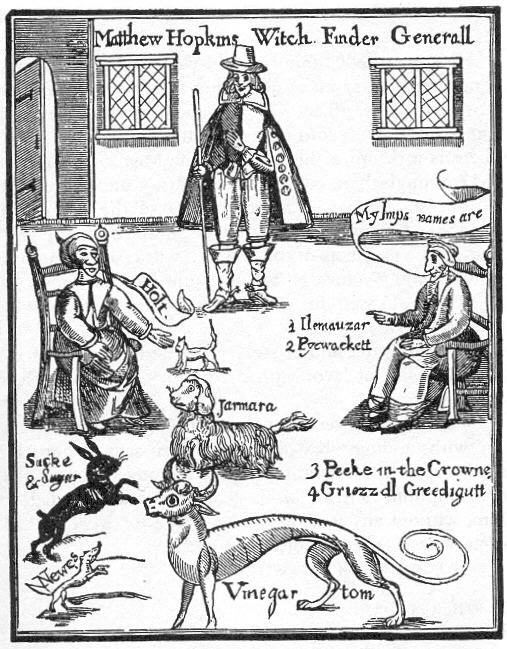 I am by far no expert, but I do remember doing some half-assed research about Cotton Mathers when I first started reading HPL and came across all kinds of strange and creepily mundane names for witch familiars. I definitely think this lends itself to the idea of a rodent with a "human" face and hands, especially when it comes to his climactic scene at the end of the story. A human would kill someone. But only an animal would devour its way through someone's body. On a small aside, has anyone else heard of a torture technique wherein a victim is strapped down and a rat places on the victim's body? A bucket or pale or somesuch is placed over the rat to prevent escape and then is heated up. The rat becomes paniced at being cooked to death and burrows out of the bucket/pale throguh the victim. I've heard of this being done by Columbian drug lords, gangsters, and the inquesition. I have always assumed it was just a colorfull and gory story, but maybe HPL heard something similar and it inspired Brown Jenkins' revenge? P.S. - I really didn't like the Stuart Gordon special effect of Brown Jenkins. but that movie/episode & Dagon comes straight after COC movie by HPLHS in my book. Excellent, and rather creepy, vid on that damnable creature. Thanks. Ready now with those switches? I seem to remember a real actual Browne Jenkins named in a witchcraft tryal, be it the Salem Tryales or otheres, but hang me by the higheste tree I cannot finde it nowe. (Will Murray has trod the same ground in "Was There a Real Brown Jenkin?" in Crypt of Cthulhu #7, http://www.crypt-of-cthulhu.com/v01.htm#007 , which Robert M Price could surely make available if he so desired). These witches' familiares doe take to themselves the oddest Names. Oh yeah, and there IS a case of a real Brown Jenkin in the British Isles besides that mongoose one. Or maybe they are one and the same, although I think this one infested the walls of a farmstead, manifested to the child first and then held intelligible conversations with the whole family, eventually driving them to despair and exodus.